SafePayPlus helps companies use Positive Pay, an excellent check fraud prevention service offered by many banks. It helps stop most (not all) counterfeit and altered checks. When Positive Pay is used with a high security check, fraud losses can be cut dramatically. Positive Pay requires the company to send (transmit) information to the bank about the checks it writes each day. This information is called a check-issue file, and contains the check number, account number, issue date, and dollar amount of each check. Sometimes the payee name is included, but is not always part of the matching service. 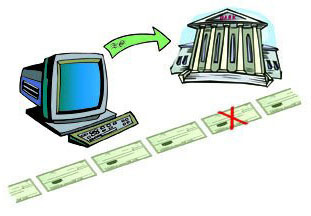 When issued checks are presented for payment at the bank, they are compared electronically against the list of checks in the check-issue file that was sent to the bank. When a check is presented that does not have a "match" in the file, it becomes an "exception item." The bank sends a fax or an image of the exception item to the client. The client reviews the image and instructs the bank to pay or return the check. The primary reason a company gives for not using Positive Pay is its inability to extract, format, and securely transmit its data file to the bank. SafePayPlus was created to solve this problem. It automatically extracts the check-issue data from the company's accounting system, formats it to the bank's specifications, and transmits it securely. SafePayPlus includes installation for most accounting software packages. Customized and "home-grown" systems may require additional charges.